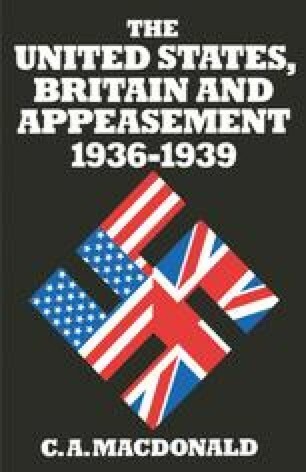 On 10 January 1938 Sumner Welles again presented his appeasement plan to Roosevelt. It was a more elaborate version of the scheme proposed in October 1937. The President was to consult the other powers about their attitude towards a world conference which would establish new rules of international conduct, discuss arms limitation and consider the questions of tariff reduction and equal access to raw materials. If the answers were favourable, Roosevelt would call representatives of the American republics and the smaller European nations to Washington, where they would draw up international agreements on these subjects. The agreements would then be sent to the other powers for ratification. Welles hoped that the American initiative would give an impetus to British negotiations with Germany and Italy. The United States would act as a ‘channel of information’ between both sets of discussions.1 Welles was leaving political negotiation? in the hands of Britain, while guaranteeing the United States a major role in remodelling the world economy. As the greatest power in a group of‘disinterested’ nations meeting in Washington, America would inevitably enjoy the predominant influence over any agreements which emerged.